Will India Inc. witness a tepid festive season this year? Each year, India Inc. looks forward to the months of October-November, which boast of festivals like Onam, Diwali, Navratri, and Dussehra, as footfalls increase tremendously in this period. It is that time of the year again when we Indians loosen up our purse strings and splurge, spending with abandon. You and I have done it: looking for offers, finding the best ones among those available, enjoying some retail therapy, or loading up gifts for our loved ones. Each year, India Inc. looks forward to the months of October-November, which boast of festivals like Onam, Diwali, Navratri, and Dussehra, as footfalls increase tremendously in this period. However, this year’s festive season comes in the backdrop of rising inflation and fuel prices, a crushed job scenario, and volatility in the equity markets. Moreover, global factors such as the ongoing trade war between the US and China, the hike in US lending rates, rising international crude prices, strengthening of the greenback, and foreign institutional investor outflows have cast a shadow on the rupee, causing it to decline. Concluding that these factors are bound to affect the daily finances of the average consumers, will this lead to a subdued festive season for India Inc. this year? Let us consider how this merry-making period will pan out for various sectors. Fast-moving consumer goods (FMCG) are non-durables that sell quickly. So, consumers who are shopping for daily use items like groceries can apparently look forward to value deals, where products are available at a 10-15% discount compared to other times of the year. Companies have planned a large-scale offensive with pricing offers and launches, which have been lined up for the December quarter, i.e. 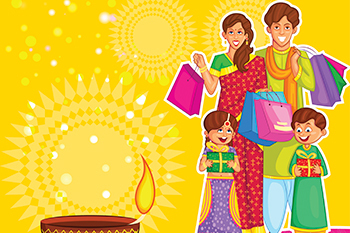 the period coinciding with Dhanteras, Durga Puja, Diwali, Christmas, and the wedding season. This move is on the back of a rather cool December quarter two years in a row mainly because of demonetization in November 2016 and the rollout of the GST in July last year, which hit consumption. What’s more, the outlook for this sector looks optimistic on account of volume-led growth, innovative product launches, and satisfactory monsoons. Furthermore, India’s economic revival is on track and GST has been reduced on various items of daily use. Conversely, consumer durable-makers apparently expect a double-digit growth in sales despite the hike as they have decided to soak up the impact and not pass it on to the consumers. Thus, manufacturers like Panasonic, Haier, Godrej Appliance, and BSH Household Appliances, who account for almost 25% of the annual sales in the segment, have promised a deal-laden season. Reportedly, they are relying on pent-up demand in TVs, kitchen appliances, beauty care, and wellness products like air-purifiers and water purifiers to work in their favour. Hiking the custom duty on luxury cars will cast a dull shadow on festive sales. Moreover, custom duty on certain components such as engines, transmission, brakes, and other parts were doubled from 7.5% to 15% in March. This was mainly done to promote local manufacturing of premium vehicles and key automobile components. Though a strong rural and urban demand could aid auto sales, India’s motown could feel the pinch because of the Kerala flood, rising interest rates, and surging crude prices. Retailers such as Future Group and Lifestyle expect the festive season to be stronger than last year as they project a double-digit growth. Positive macro-economic factors such as an 8.2% growth in the last quarter and an almost-normal rainfall may have sparked off this expectation. Moreover, they are relying on the easy availability of consumer finance to boost up sales. Moreover, this festive period accounts for 30-45% annual sales for such retail outlets. Though Kerala’s sales were washed out due to the monsoons, companies expect consumers in metros and large cities to be flexible with their spending mainly lured by discounts, promotional offers, etc., while rural consumers will be buoyant on account of good monsoons. Retail outlets have increased order volume from brands for this festive season by 50-80% as compared to last year. Things don’t appear so good for the precious yellow metal though. Volatility in the rupee-dollar forex market and the greenback’s strengthening has led to a retreating demand for gold. Geo-political concerns fueled by Trump’s constant rhetoric and subsequent responses by China have increased investor wariness. Moreover, gold prices usually rise during the festive season; however, the sale of jewellery is expected to slow down this year due to a depreciating rupee. Usually, the dollar-rupee equation does not affect gold, but since it is mostly imported, gold prices will probably rise. Presently, the rate of gold has been ranging between Rs30,500 - Rs31,000 per 10 grams in the retail markets. As the shopping spree begins, gold prices are expected to rise. Meanwhile, Union Finance Minister Arun Jaitley has suggested that there could be an increase in the duty on gold, which would increase the retail cost of finished goods. Currently, gold imports carry a duty of 10%. Further, forex experts believe that the rupee would soon touch 75 against the dollar, consequently pushing gold prices to Rs32,000 per 10 gms. Some other analysts concede that demand may be muted due to the Kerala floods as the flood-hit state boasts of robust demand for gold in this season especially. E-commerce companies such as Flipkart and Amazon feed into the shopping frenzy surrounding the festive season and usually have bumper sales. This year will be no different. The e-tailers will probably engage in a discounting wars to gain sales in categories like smartphones, televisions, and fashion brands, which make up for over 70% of their sales. What’s more, they will reportedly make a total sales worth ~Rs10,000cr. Amazon’s “Great Indian Festival” and Flipkart’s “Big Billion Day” from October 10 are all set to rake in the moolah as companies try to make it their biggest festive season in terms of sales, discount, deals, and payment options.